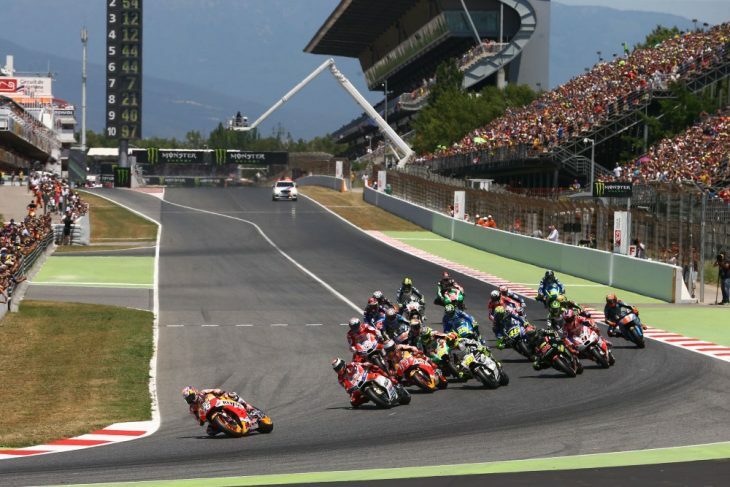 Statistics Leading Into The 2018 Catalunya MotoGP—The Catalunya MotoGP is one of the modern-day classics of Grand Prix racing. It’s a race every rider wants to win. This year has even more significance with the resurgence of multi-time Catalan winner, Jorge Lorenzo on the factory Ducati. The entry into turn one comes after one of the fastest straights on the calendar. Catalunya has been the scene of some truly epic races. These include the iconic 2009 battle between Jorge Lorenzo and eventual winner, Valentino Rossi. Plus, there was the three-way battle between Rossi, Dani Pedrosa and Casey Stoner in 2007. That race went to the Australian on his march to a first world title. Below is a series of stats brought to you by MotoGP.com leading up to this weekend’s Catalunya MotoGP. This is the 27th successive year that the Circuit de Barcelona-Catalunya has hosted a Grand Prix event. It was first included to the Grand Prix calendar in 1992. Only three current venues have a longer ongoing sequence of hosting Grand Prix events: Jerez, Mugello, and Assen. A total of 78 Grand Prix races for solo motorcycles have been held at the Barcelona-Catalunya circuit since 1992. They are as follows: MotoGP™ –16, 500cc–10, Moto2™ –8, 250cc–18, Moto3™ –6, 125cc–20. Yamaha are the most successful manufacturer in the premier class. The company has 12 wins: 9 in MotoGP™ with Jorge Lorenzo and Valentino Rossi, and 3 in 500cc with Wayne Rainey (1992, 1993) and Luca Cadalora (1994). Honda have had 10 wins in the premier class. These include five successive victories with Àlex Crivillé, Carlos Checa and Mick Doohan in the years 1995 through to 1999, in addition to the wins with Valentino Rossi (2001, 2002), Dani Pedrosa (2008), Casey Stoner (2011) and Marc Márquez (2014). Ducati has taken three MotoGP™ wins at the Catalunya circuit. This included their very first in the class with Loris Capirossi in 2003 (of which it’s 15th year anniversary on the opening day of the 2018 Grand Prix). The last win for a Ducati rider at the Catalan GP was last year with Andrea Dovizioso. The last win by Suzuki at the Catalan GP was in the 500cc class in 2000, with Kenny Roberts. In 2016 Maverick Viñales’ fourth-place equaled the best result for a Suzuki rider at Montmeló since the introduction of the MotoGP™ class in 2002. That had previously been achieved by John Hopkins in both 2006 and 2007. Aleix Espargaró started from pole two in 2015 at Catalunya; the first pole for Suzuki since Chris Vermeulen took the top qualifying spot at the Dutch TT in 2007. The last Yamaha rider to start from pole position at Catalunya was Jorge Lorenzo in 2010. This was also the last time that the rider starting from pole won the MotoGP™ race at this circuit. The only other rider to have won the MotoGP™ race at Catalunya from pole position is Valentino Rossi in 2006. There have been nine wins for Spanish riders in the premier class in Montmeló: Alex Crivillé in 1995 & 1999, Carlos Checa in 1996, Dani Pedrosa in 2008, Jorge Lorenzo in 2010, 2012, 2013 & 2015, and Marc Márquez in 2014. There has been at least one Spanish rider on the podium in the MotoGP™ race at this track for the last eleven years. The eight Moto2™ races that have taken place in Catalunya have been won by six different riders. They are Yuki Takahashi (the only victory for a rider riding a Tech3 bike so far), Stefan Bradl, Andrea Iannone, Pol Espargaró, Tito Rabat, Johann Zarco and Álex Márquez. The only rider who has more than a single Moto2™ victory at this circuit is Johann Zarco, who won in 2015 and 2016. Only two of them have not won from pole position: Yuki Takahashi (2010) and Andrea Iannone (2012). The six Moto3™ races that have taken place at the Catalunya circuit. They have been won by six different riders: Maverick Viñales, Luis Salom, Álex Márquez, Danny Kent, Jorge Navarro and Joan Mir. Only one of them has been won by a non-Honda riders: Luis Salom (KTM–2013). Three of them have won from pole position: Maverick Viñales (2012), Luis Salom (2013) and Álex Márquez (2014).